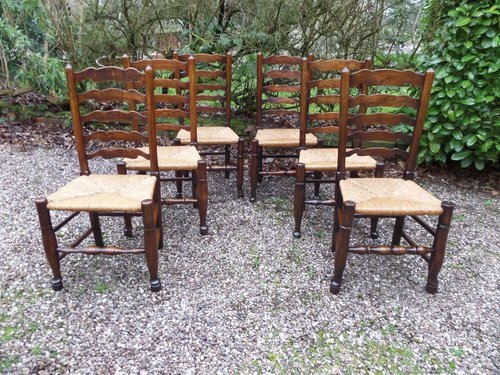 A Great chance to buy a matched set of sixL18TH/E19THC ash and elm Lancashire ladderback chairs . In restored condition,ready to go,no shakes wobbles etc and with excellent rush seats. The colour is great, rich with a lovely patina. We can supply carver Armchairs to match . Known as Lancashire ladderback chairs as that is their county of origin see Regional chairs W Cotton . Del UK£70 export arranged.